Made this card for one of my returning Copic markers buyers. This time she bought the Copic multiliners which I newly added into my store. I adopt the simple sketch from MFT Wednesday Stamp Club Challenge #205 (MFTWSC205) as shown above. Somehow, I mirror the sketch as I want the sentiment to fit as explained below. 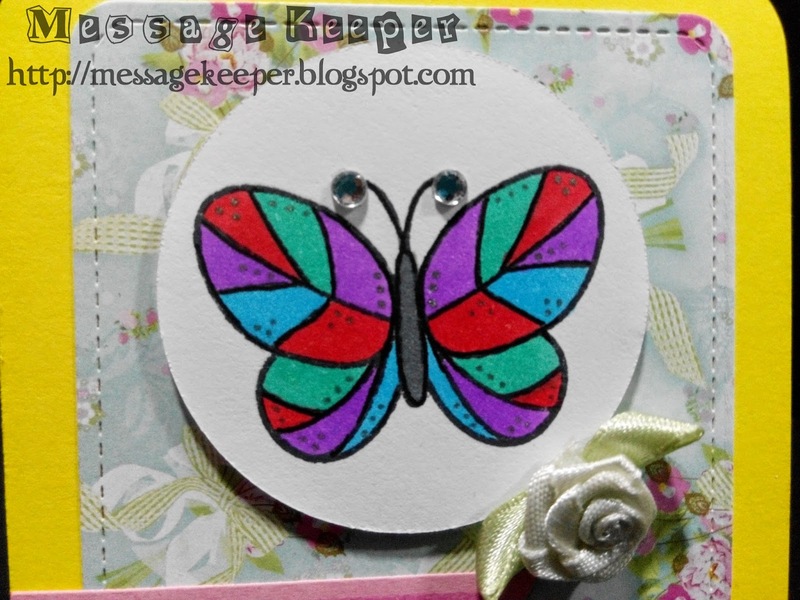 First, the butterfly is stamped onto a white circle and colored using Copic markers. Some dots are randomly added to the proportion of the left wing using glitter silver pen and replicate to the right wing after that. These silvery dots really add some interest onto the butterfly! A pattern paper that is die cut using the stitched journaling card die is attached onto a yellow card base. 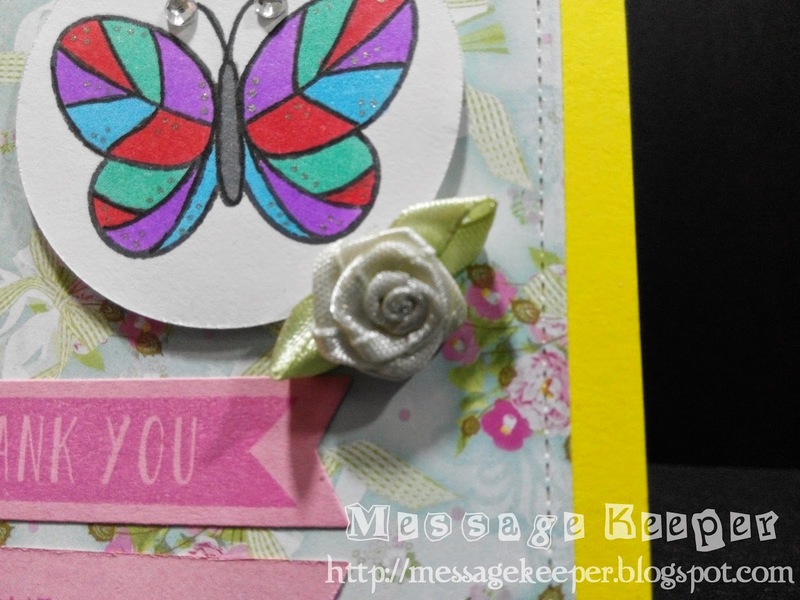 Then, the circle butterfly is attached onto the journaling card using foam tape as in the sketch. For the sentiment, the "Thank You" is stamped in pink ink onto a pink banner with die cut earlier. I am just happy that this "Thank You" banner stamp fit just nice into the banner die cut even they are two (2) different brands. The next sentiment, "For Your Purchase" is also stamped onto the pink banner using pink ink. These sentiment banners are then attached onto the bottom left side of the card as in the sketch. I omitted the third banner from my card as there is not enough room. For the final finishing, I added two (2) gems onto the butterfly antenna. I also added a pre-made rose as embellishment as in sketch to the card. Finally, the four corners of the card base is rounded to match the journaling card. Dimension : 11.43cm x 8.89 cm or 4.5" x 3.5"
Such a wonderfully colorful butterfly! Thanks for joining us at ATSM! 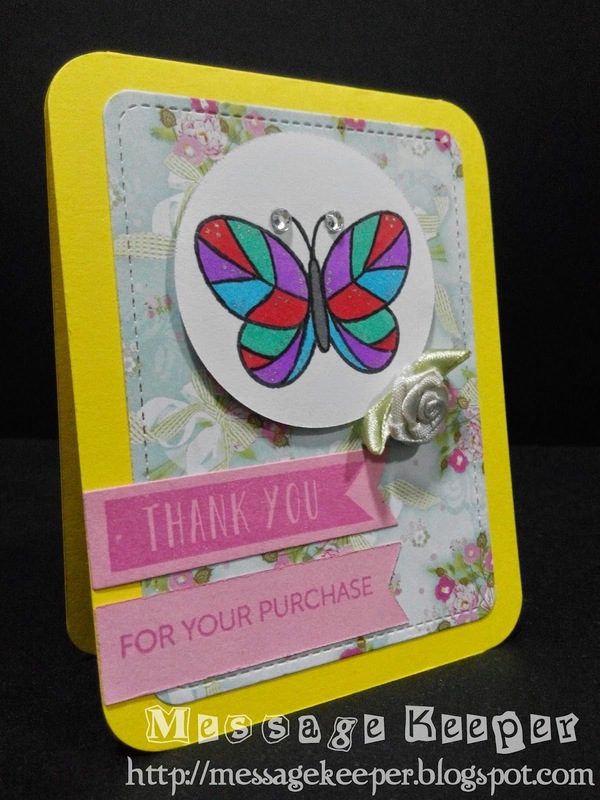 What a super card - i do like this butterfly - love the stained glass look. Thanks so much for playing along with ASM this week! Such a nice card and gesture! the colors are brilliant. Thanks for joining us at ATSM.